Your hamster may have stolen your heart even before you brought him home, but his cage before long possibly stole your urge to take in a whiff of air near it. It's usually his urine that stinks so awfully. Controlling the nasty odor may require a few adjustments on your part and maybe even a new hamster enclosure. Opt for a caged enclosure. Plastic enclosures, especially those that are entirely plastic, trap odor. Aquariums, meanwhile, have poor airflow thanks to their glass walls. When your hammie pees in an aquarium, the ammonia builds up because it exits more slowly than from a cage. You can promote better airflow and odor control in aquariums by adding a cage tank topper as a second story. Ultimately, a fully caged enclosure will give you the best airflow and best odor control. If you have a dwarf hamster, make sure he can't squeeze between the bars to make a getaway. Choose the right substrate. Avoid hay and straw as those two substances, while comfortable for your hammie, are poor at absorbing odor. Hardwood shavings work well, and any brand that has wood pulp will usually do a good job of keeping nasty smells at bay. Add an even 2-inch layer of bedding to your hammie's enclosure. This depth allows your pal to make nests and burrow, but more importantly for your nose, it helps absorb urine. Spot-clean your hamster's cage each day. One of the most effective ways of putting a stop to bad smells swirling around in your hammie's enclosure is to remove the spots of bedding that your hamster uses to relieve himself. 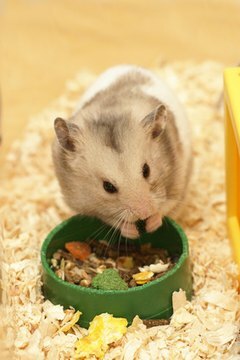 Many hamsters urinate in one or two areas of their cage only, so spot-cleaning is quick and easy. Toss out the soiled bedding and add fresh bedding in its place. Clean your hamster's enclosure weekly with soap and water. As long as you spot-clean each day, a once-weekly cleaning should be enough to keep the cage smelling fresh. Scoop up your hamster and put him in a hamster ball or separate enclosure. Remove all of his toys and accessories. Dump his bedding, then start washing everything down with hot water and a mild dish detergent. Rinse everything thoroughly with more hot water until all of the soap is gone, and dry thoroughly before adding a 2-inch layer of fresh bedding. Put your hammie and his toys back inside. Teach your hamster to use a litter box. Although the thought of training a hamster to use a litter box might sound incredibly difficult, it's actually quite simple. Use chinchilla sand -- not chinchilla dust -- as the litter in the box. Pay attention to where he normally pees and place the litter box near the area. Throw some soiled bedding into the litter box and he'll likely start using the box to do his peeing business. He probably won't defecate in there.  If you have multiple hamsters in one cage, you will likely need to fully clean the enclosure twice weekly.  Remember to keep your hamster somewhere safe when cleaning his cage. Hamster balls work best, as they prevent him from escaping and give him a chance to exercise.  Don't use a bleach-and-water solution to clean your hamster's cage. It can be incredibly difficult to remove the bleach smell, and your hamster may react poorly to it. Stick to hot water and soap. ⚠ Never use cedar chips, pine chips, kitty litter or corn cob in your hamster habitat. Those types of bedding can pose a serious health risk to your hamster. ⚠ If you opt for a litter box, make sure you're filling it with chinchilla sand and not chinchilla dust. Dust can cause respiratory problems.